Epson EH-TW9300W review | What Hi-Fi? If it looks like a duck, swims like a duck and quacks like a duck, then it probably is a duck. But if it’s called “4K-enhanced”, as Epson’s EH-TW9300W projector is, you're entitled to question if it swims or quacks in native 4K. The EH-TW9300W uses some complex processing to scale true 4K information down to its native 1920 x 1080 resolution. It isn’t the first of Epson’s projectors to feature ‘4K-enhanced’ technology – 2015's EH-LS10000 had it – but for those hoping to get true 4K quality at a lower cost, this isn’t the duck you're looking for. Accepting native 4K content and then downscaling it to Full HD resolution doesn’t give as sophisticated or insightful an image as a true 4K projector, but with those devices starting at around £6000 there’s a clear correlation between price and performance. And the TW9300W’s processing does look good, combined as it is with HDR capability. Digging into the specs, the TW9300W can shine 2,500 lumens of brightness onto your screen, with a claimed 1,000,000:1 contrast ratio. That’s considerably more than the 1800 lumens and 120,000:1 ratio of the Full HD Sony VPL-HW65ES, our current favourite at this price point. Going though menus and setting the TW9300W up for optimal performance is quick and simple, and its motorised lens adjustment control is responsive. You can use one of the ‘colour mode’ presets like Dynamic (which Epson recommends for prioritising brightness) or Digital Cinema (for vivid colours). But we prefer the Natural preset (it's best for faithfully reproducing the image source) and fine-tuning using a THX Optimizer disc. The remote control is laid out logically and feels good to use - the only thing on our wishlist is we’d like it to automatically light up when it’s used rather than having to press the backlight button for the Halloween-style orange glow. The TW9300W is on the hefty side. It’s around 50cm wide, and of similar depth - so you’ll need a suitably sized stand or sturdy ceiling bracket. If that means placing it away from your Blu-ray player, the WirelessHD Transmitter the projector comes with can beam content across the room. Epson recommends keeping it within a 10m range. You can connect up to four devices – enough to cover your player, games console, and any other 4K HDR sources – and there’s also an optical output for sound. While the WirelessHD Transmitter is certainly stable – we don’t notice any drop-outs while using it – there is a noticeable drop in image detail and texture compared to a hard connection to the projector. Speaking of which, there are two HDMIs on the projector’s body, one of which has the HDCP 2.2 protocol to carry HDR. You also get USB, a connection for your PC and an ethernet port. There’s a Trigger Out port (to connect up a motorised screen, for example). For 3D fans, this projector supports this too - but it doesn’t come with any glasses. Those on Epson’s website are £65 a pair. The number of native 4K projectors is still relatively small, and they certainly cost more than the EH-TW9300W. So it’s quite satisfying the picture from this projector ticks plenty of our boxes. For a start, the TW9300W shows good handling of detail during bright scenes. We start off with a 4K HDR copy of The Revenant, and Andrew Henry’s (Domhnall Gleeson) scraggy clothing and equally scraggy facial hair is surprisingly sharp. You can make out the different textures to the well-worn material, and after the bear attack that savages Hugh Glass (Leonardo DiCaprio) the combination of blood, dirt, and drool covering his face is pretty clear. When it comes to colour, the TW9300W has no trouble putting out something punchy. Playing Planet Earth II, the brilliant turquoises and jades of the Panama islands really pop, and the way white detail is put across is impressive. Wispy clouds are distinguished from the dense, stormy kind, and there is a good variation between the powered flakes and the harsher ice of the snow on the Himalayas. Some of the colours are a little brash, though, and don’t quite have the subtlety of hue we know are in the picture. When it comes to darker scenes, such as the interior of 221B Baker Street in our Blu-ray of Sherlock’s ‘The Abominable Bride’, the TW9300W goes commendably black. But it fails to provide the insight to fully back that up. Making out the decoration of doorways or the detail in the 19th century garb is a challenge. Playing an UltraHD Blu-ray of X-Men: Days of Future Past, the TW9300W has a decent sense of motion - although we do turn Frame Interpolation (a motion-processing mode generating extra frames to smooth movement) to ‘Low’. While most projectors occasionally display an element of judder this way, the extra image here stability makes for an acceptable trade-off – and it lets the Epson keep up with the quick fight scene between Wolverine and the young Beast. 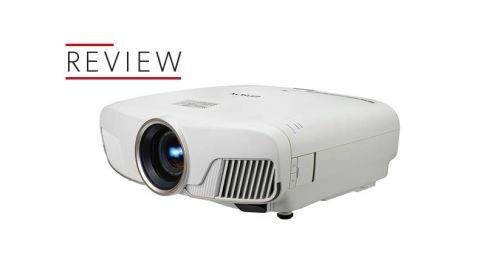 If you can ignore the 4K-enhanced claims and instead see the TW9300W for the impressive downscaling projector it is, you won’t be disappointed. The picture is crisp and the colours bold, and its wireless transmitter means it can connect to a multitude of 4K HDR sources. We’d like a little more subtlety in its performance before it gets full marks, but if you’re booting this one up for movie night it won’t let you down.